Poor, but interesting photo of a mysterious electric locomotive – probably EU41. Assignment to the Gdynia depot is not helpful in identification. Another picture, possibly taken on the same occasion. Both photos courtesy Robert Prusakowski. 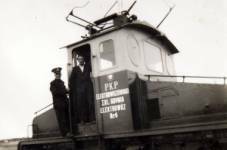 After WWII Polish state railways PKP took over two small electric locomotives of German origin. One of them was E401 (later re-designated EU40, but probably only formally) from the Wüstewaltersdorfer Kleinbahn in Lower Silesia. This locomotive has miraculously survived until today and is plinthed in Warsaw. The other was less lucky: not only it has not been preserved, but very little is known about it – even its PKP designation is only a matter of conjecture. This mysterious locomotive appeared about 1954 in Wąbrzeźno (formerly Briesen Westpreussen) in northern Poland. Local railway, initially known as Stadtbahn Briesen, operated a single line just 3.28 km in length between two stations, Briesen Stadt and Briesen Bahnhof. It was opened in April 1898 as the first electrified local railway in Prussia (470 V DC, supplied from a local power station). Initially there were three railcars, built by Beuchelt & Co. and numbered 1, 2 and 3. After WWI this railway was not incorporated into PKP and was operated by local authorities. After the fall of Poland in September 1939 it was renamed Kreisbahn Briesen. When WWII ended, Polish state railways were initially not eager to take over this small local line, which somehow managed to keep all three old railcars in service. The railway, however, soldiered on and the railcars were soon found insufficient, so a new locomotive arrived about 1954. This small, two-axle machine is known from just a handful of photographs, all of quality which does not allow for a reliable identification. According to the monograph by Robert Prusakowski, it was purchased (or leased) from PKP and had been previously used in Gdynia. Possibly it was similar to (but certainly not identical with) the above-mentioned E401, which suggests it had been built by AEG, but this is just a conjecture. ‘New’ locomotive, with service number 4, did not enjoy long service in Wąbrzeźno. In 1958 the railway was finally taken over by PKP and ‘de-electrified’ in 1959. Electric locomotive and railcars were replaced by SM30 and SM42 diesels, later by a SN61 diesel railcar. Scheduled passenger traffic continued until 1991; the line still exists, but serves as a factory siding only. The fate of No.4 is unknown, but most probably it saw no service after 1959, due to untypical voltage and obsolescence. It is almost certain that, together with the railcars, it was scrapped soon afterwards; details are lacking. According to the new designation system, which was introduced by PKP in July 1959, No.4 could become EU41: it is known that EU40 and EU41 designations had been reserved for existing locomotives, and EU40 was assigned to the E401. There is, however, no confirmation of this designation being actually given. Almost no technical or historical data of this mysterious machine is available, so any amendment or comment is most welcome. Number 41 was later given to a heavy two-section freight locomotive from HCP (ET41). Note: other data not available.